«©NCSX» Freddy, meet Jason and Jason, meet Freddy. What happens when two unstoppable forces of nature stand on the same stage and slash away at the air? Answer: Not Much. Despite being titled a Freddy vs Jason Fighting Game, the two killers actually stand cheek to cheek (the lower cheeks) and face away from each other. 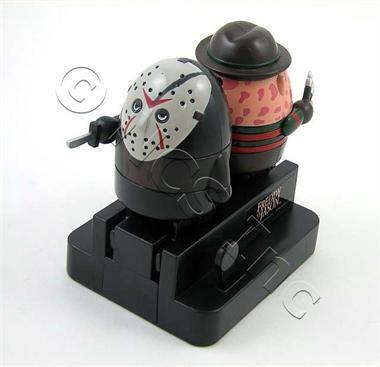 A little lever on the side of each figure may be toggled to make Freddy and Jason tilt to and fro in an apparent lunge move... away from each other. We don't see the point of non-confrontation but the toy is in stock today. 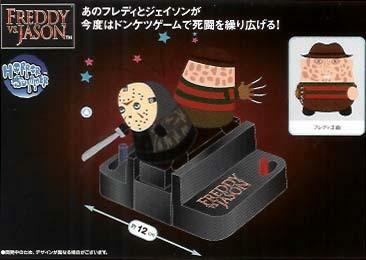 honestly all u realy dos is pull a few lever and they just sorta attack in the vopposite direction of freddy\jason so id have to say knock it of nur christmas list!